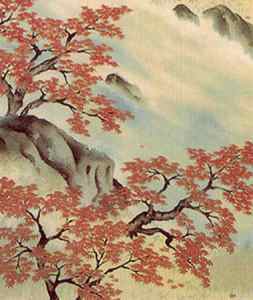 Yokoyama Taikan (1868-1958) was born in the prefecture of Ibaraki but he moved to Tokyo in 1878. This period of history in Japan would witness many events because time didn’t stand still during the Meiji, Taisho, and Showa periods of history. Not surprisingly, some of his work during the nationalist period was influenced by the sentiments of the time. 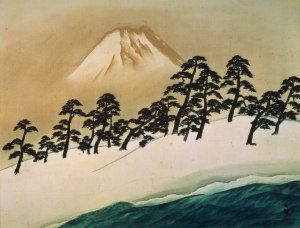 Therefore, not all images of Mount Fuji by Yokoyama Taikan were solely based on art because they also had a political angle. However, irrespective of political issues, the artist himself was blessed with rich skills and his legacy is great. When Yokoyama Taikan was a teenager he was fascinated by western style oil paintings and he was also interested in the English language. During university, his fellow classmates included Saigo Kogetsu, Hishida Shunso, and Shimomura Kanzan. This extremely talented bunch would all become famous in their own right and Yokoyama Taikan also studied under Hashimoto Gaho. Once Yokoyama Taikan had graduated he entered the world of academia and this applies to teaching in Kyoto and then returning back to Tokyo to teach at the Tokyo Bijutsu Gakko. However, loyalty was always very important to him. Therefore, when Okakura Kazuko (Okakura Tenshin) was forced out of his job because of political reasons, he also resigned based on deeply held principles. This highlights the importance of his background and the fact that Yokoyama Taikan was principled to things that he believed in. The death of his wife was followed by a period of traveling to Berlin, Boston, Calcutta, London, Paris, New York, and other cities. This must have impacted greatly on Yokoyama Taikan because each place had its own culture and the art scene would have varied greatly. It must be remembered that artists, film stars, writers, and so forth, were put in the frontline at home irrespective if the artist resided in America, Germany, Japan, the United Kingdom, the Soviet Union, or in other nations that took part in the war. 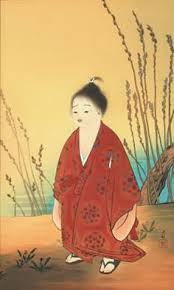 The loyalty that Yokoyama Taikan showed towards his mentor during his early life was part and parcel of his character. Therefore, he naturally followed the ideals of the society that he resided in during a time of crisis. 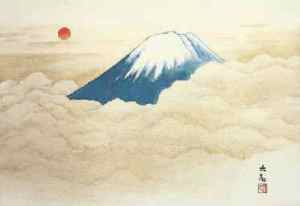 The legacy of his art isn’t in doubt because Yokoyama Taikan produced many stunning pieces of art and he influenced many important artists. Throughout his life, he was always looking for new ideas and angles. Hopefully, this article and the images on view will entice some readers to delve more deeply into his life.